Veronika Pehe:What are the main demands of your initiative? Monika Helak: The main goal is to democratize the university which at the moment has a very hierarchical structure. The voice of students is not really heard. We want to heighten our visibility and be able to express ourselves. There are many students’ interests that the university authorities are not really concerned with. We want to discuss the fact that we have a free university that is not really free, as we increasingly have to pay fees for various parts of our education. This was also the incentive for starting your initiative – the new study regulations have shortened the existing period for thesis submission and introduced a fee if this period is exceeded. MH: Yes, and this was very unfair to us. Unfortunately we lost this particular fight against the new regulations and for now we are focusing on making their effects less damaging to us. The underlying assumption for all these changes is that the university is not a business, which was also the main slogan of our campaign. What is the relationship between your initiative and the rest of the student body? Have they been supportive? Borys Jastrzębski: The Engaged University is a very diverse thing. The support for our movement is probably similarly diverse, which also applies to the Students’ Union in general. MH: We met with a lot of sympathy. But parts of the Students’ Union don’t like us, they see us as competition rather than viewing our initiative as the common interest of all students. They are just battling for their own position. What kind of attitude towards you did the academic staff at the university take? BJ: We have had tremendous support from them. Although there is some division amongst the faculties – for instance, the sciences are much more conservative. But we had many professors who signed a letter of support for us, and even came to our meetings, including academic staff from other universities. MH: But then there is also the academic management and the Students’ Union, who actually responded quite hysterically when they heard we were organizing demonstrations. I think this is quite different to the way Students’ Unions function for example in the UK. Our Students’ Union thinks that the best way to handle student politics is to have good relations with the authorities. What is your broader vision for an engaged university? What needs to change? MH: We would like to change the regulations at our university, we also want to build a bigger representation of students in the university senate, and we aim to address the most difficult questions of student life. These include the condition of some of the buildings, the issue of fees, or scholarships. I think there are many little things that create a bigger picture of a university that at the moment really isn’t a friendly place for students. BJ: The underlying assumption for all these changes is that the university is not a business, which was also the main slogan of our campaign. We also work closely with the Crisis Committee of the Polish Humanities, which fights against the politics of the Ministry of Science and Higher Education in Poland. What exactly is your idea of engagement and what should it look like in practice? MH: The basic idea is to have at least some engagement in the first place. There are approximately 50 000 students at the University of Warsaw. The majority of them are not interested in university life, for instance they do not vote in student elections. This is mainly because the university does not want to be the right place for students, and the way to change that is to engage. We would like for students to want to change the mentality of the authorities, to make the place more democratic and to make the university into a kind of a second home for us. For now, it is a hostile place especially to those students who are crowded in large faculties such as Law or Economics. B: We are fighting for a less bureaucratic institution, which is a challenge with 50 000 students. What is the situation at other universities in Poland? BJ: We have a sister initiative in Krakow and there are some other protests going on elsewhere. MH: There are also many already existing organizations that want to cooperate with us, so I think we have a good perspective. The media actually gave us a lot more attention than we expected and it was really nice to hear that students at other universities, including those abroad, also gave us their sympathies. What was the attitude of the university authorities to your initiative? BJ: First we had a rather unfriendly reaction from the rector. The only commentaries to our actions came via the media in the beginning. MH: For instance, the university president did not contact us directly, but commented on one of the articles about us, which gives you an idea of the kind of mentality we are dealing with. BJ: But eventually they did start responding, and when the vote on the new study regulations was passed, they offered us some consultations, even though they have chosen a very specific method – a deliberative poll. They will choose a number of experts with whom they will then organize workshops. The problem is that we will have no influence on the choice of experts. So they did respond, but too late and we did not feel that it was in good spirit. Have you thought about radicalizing your strategies? There are approximately 50 000 students at the University of Warsaw. The majority of them are not interested in university life, for instance they do not vote in student elections. This is mainly because the university does not want to be the right place for students, and the way to change that is to engage. MH: This is something we have discussed. I think we have not yet chosen a specific path of radicalization, but we have decided to criticize openly, something that the university still does give us a chance to do. For now we are trying to be a political movement and I think that way we can achieve something – if we win the elections, we can have our representatives in student parliament. So far there are only a few of us there and that is not enough. We want to be part of the discussion and educate other students. BJ: We have also been invited to a debate that is not open to the general public organized by the Ministry of Science and Higher Education. MH: This means we are being acknowledged. In general we have media sympathy and attention and the enthusiasm level is still high, so we will work very hard on developing our structures and organizing events. How do you make decisions? What is your structure within the movement? MH: We have special working groups with different tasks – for instance one is concerned with the media, another organizes events, yet another deals with international cooperation, we also have a group dedicated to political strategy. Each group has a coordinator and these coordinators then meet to discuss what is going on in their group. BJ: So it’s a mess, but an organized one! M: And a very democratic one, too. What is your goal for the upcoming months? MH: Although the new study regulations apply to the whole university, faculties can set fee levels individually, so we will try to convince them to set them at zero. This is a matter that is voted on at faculty level, so we have to convince them to vote in this way, but it will be difficult because many faculties of course find the fees financially advantageous. It is not possible to win everywhere, but if we manage to push this through in several faculties, then that will set a good example for the future and for other students. So this is the plan for the next months and the next year – unless the study regulations change, which is unlikely. The summer break is approaching. How do you plan to sustain the momentum of the initiative? MH: We will be working and are thinking about organizing a summer school. I think it would be attractive to many students. And we are also planning to prepare some big events for the beginning of the academic year, so I think that should sustain the energy and influence we have now. I don’t see any other possibility. BJ: I think that it is impossible to sustain the momentum not just because of the summer, but simply because everyday work is less exciting than protests that are much more engaging. The summer break is usually dead. But the rectorate proposed to us that we prepare a commentary on the new study regulations and on the charter of the whole university, which will be the subject of a vote in the next year – so there will be more consultations then. MH: Generally what we have achieved is that consultations at the university are now much more important. Monika Helak is a student of Sociology at the College of Interdisciplinary Individual Studies in the Humanities and Social Sciences of the University of Warsaw. Borys Jastrzębski is a student of Philosophy at the College of Interdisciplinary Individual Studies in the Humanities and Social Sciences of the University of Warsaw. 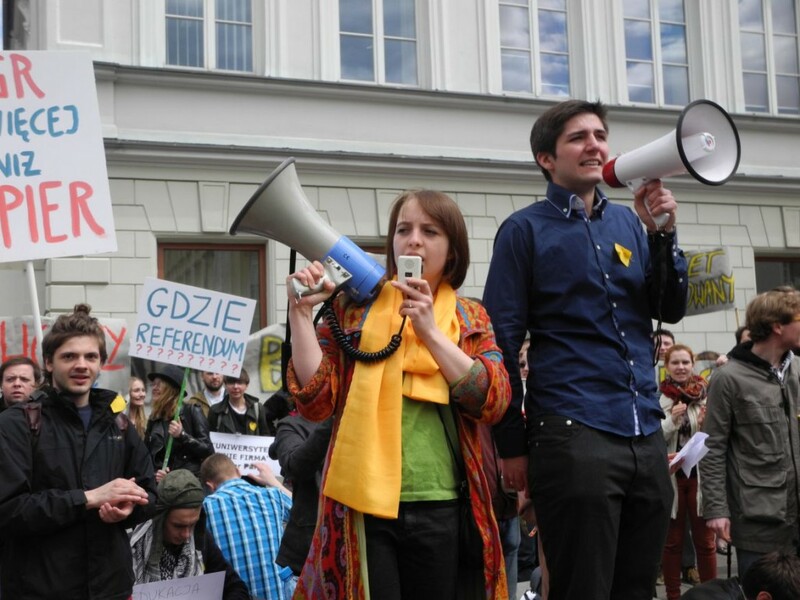 Veronika PEHE: Polish students are not alone! Mikołaj BENDYK: Nothing about us without us!